Average-joe Mike Flaherty (Paul Giamatti) lives with his typical nuclear family in a commonplace town where he runs a formerly adequate law practice and coaches a wrestling team full of so-so teens. Things haven't been so good for Mike, his business is floundering and his team is sucking worse than usual, and he is having anxiety attacks that put him on the ground they are so bad, though he only has one throughout the entirety of Win Win, these nervous spells aren't nearly as persistent as that annoying water heater than bangs and clangs in his firm's basement. Mike can't afford to fix it or to cut down the tree rotting in his front yard and desperation is knocking at his door. Luckily, so is opportunity. One of Mike's clients is a well-to-do older gentleman (Burt Young) in the early stages of dementia. The state of New Jersey wants to take Leo under their care, but Mike would rather collect the $1,500-a-month stipend as Leo's legal guardian. It's a scam, of course. Mike lied and puts Leo in a home, and he'd have gotten away with it if it weren't for a meddling kid. Leo's grandson, Kyle (newcomer Alex Shaffer) shows up on the old man's doorstep. He came to stay with the grandfather he never met while his mother (Melanie Lynskey), who hasn't seen her dad in twenty years, goes through rehab. Unable to explain the truth about why Leo is in assisted care, Mike and his wife (the excellent Amy Ryan) take the troubled teen in. This is good fortune for everyone: Kyle gets a stable environment while he waits for his mom to re-emerge, and since he was a wrestling champion back in Ohio, Mike now has a chance to turn his team around. This is the plot of Win Win, the new film from actor-turned-writer/director Tom McCarthy. McCarthy has created a (debatably) respectable niche for himself making well-meaning art pictures that tackle tough subjects in a tidy fashion. He almost got it right in 2007 with The Visitor, a film about xenophobia and immigration and post-9/11 injustice that blows it at the finish but otherwise is pretty good. Both it and Win Win are better than his 2003 debut, art-house darling The Station Agent, a pandering piece of fluff that allowed the indie-movie crowd to pat themselves on the back for embracing "real" human drama--despite how far removed the film really is from the messy reality it purports to represent. Win Win is more of the same, and though maybe less calculated than The Station Agent, it plucks at some pretty obvious heartstrings. Like Mike, McCarthy almost gets away with it, too. Watching Win Win is a pleasant experience. I basically enjoyed it while it was happening, but for as tight as the basic framing is, the foundation is rickety. Poke at any minor moment of Win Win and the whole thing crumbles. For McCarthy's film to be as profound as it pretends, he would have had to dig deeper, getting below the surface grit and establishing his narrative in much richer soil. This is a film full of obvious metaphors--the rotting tree, a stained glass angel falling and losing its center--and people spouting seemingly innocent dialogue laced with "unintended" meaning. (Daughter asks mommy where daddy is, mommy says daddy is out running, daughter asks, "Running from what?") Problems are not dealt with or solved in any way we see, we are just told that this solution fits that conundrum and everyone is ready to move on. It all fits together nice and slick, and I know a lot of people were satisfied with it, but Win Win left me wanting. Which doesn't mean I hated it. I was careful with the adjectives I chose in my opening paragraph. Win Win is aggressively average in just about every way. 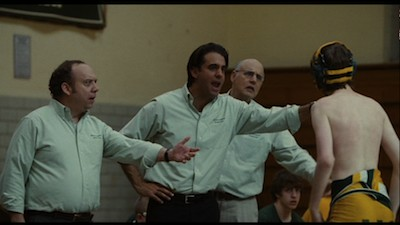 It's not sufficiently thoughtful to inspire a great deal of soul searching, but it's also not so ill considered as to insult a more demanding viewer's intelligence; likewise, it doesn't push the easy sentiments hard enough to crossover and win the hearts and minds of regular moviegoers the way something like The Blind Side would. I mean, we do get a scene with Mike and his brood going to church, but there isn't much by way of preaching, no easily repeated parables that folks can walk away parroting. Yeah, Kyle takes the Flaherty's emotionally hostage in such a way that teaches them more than they teach him, but no one ever says so out loud. Hell, no one ever calls the resolution a "win win." Missed opportunity, or just a moment of truth? Because no one truly wins. The old man really can't take care of himself, and Kyle's family remains fractured, not matter how big a smile Paul Giamatti puts on Mike's alleged ethical cleansing. It's sitcom psychology. Apologies, hugs, LOL! The one thing that does elevate McCarthy's production is his cast. Giamatti and Ryan are both excellent in their roles, giving real heft to the relationship and establishing a comfortable rapport that makes their marriage believable. Melanie Lynskey is also a standout supporting player, capturing her character's emotional instability in a way that strikes the right balance of selfishness and vulnerability. Even Alex Shaffer manages to make Kyle's adolescent outbursts understandable. His performance goes beyond the usual heavily crinkled brow and mumbled teenage poetry. The young actor understands why his character acts out and makes sure to layer that motivation underneath the anger. He has both explosions and implosions, sometimes simultaneously, and they never seem like they are just for show. It's too bad there's so much wasted effort here. There is nothing nourishing about Win Win, it's purely empty calories. You might be just fine watching it--I know I was, I was never really bored--but nothing I took away from the film lasted. I wasn't moved or changed. I'm the same guy that pressed play on the DVD, just a couple hours older and not at all wiser. It can be a little tricky to judge pre-release Fox discs for review, they are never exactly the same as the final copies that will be for sale in stores. 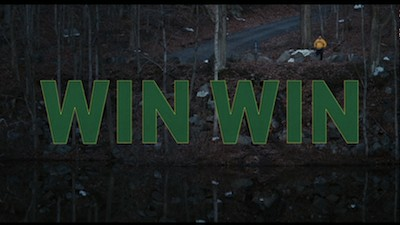 In terms of specs, Win Win is getting an anamorphic widescreen transfer that, at least on my copy (which includes intermittent appearances of the Fox logo), is...well, here's the word again, average. The print is clear and colors are fine, though edges are often fuzzy and there is generally some digital noise throughout. My guess is this is the screener and will likely look better when the actual retail edition comes out. That said, the 5.1 audio mix on the preview disc sounds really good, filling the room with a well-balanced sound presentation. Not a ton of subtle effects, but an excellent use of volume where it counts. 2.0 tracks in French and Spanish are also available, as is Closed Captioning in English and optional Spanish subtitles. Two deleted scenes lead the supplement section, running less than two minutes all together. These are added character moments that bring nothing to the movie and their inclusion isn't of much note. 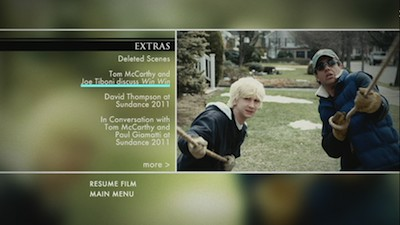 The rest of the informational extras, such as they are, are a quartet of behind-the-scenes interviews, half of which were shot at Sundance this year, including a two-and-a-half minute joint interview (with clips) featuring McCarthy and Giamatti and about the same amount of time following David Thompson, who has a minor role as a wrestler, around the festival. Longer (just under seven minutes) is a piece with McCarthy and contributing writer Joe Tiboni, who drew from his own life for the movie. A segment called "Family" hits the main cast members super quick, letting them pontificate on each of their characters. In terms of extras, these aren't very detailed or forthcoming explorations of craft; rather, they are fairly standard, insubstantial puff pieces. Finally, there is a music video by the National and a theatrical trailer. I know a lot of people, including plenty of critics, loved Win Win. I didn't. The story of a small-town lawyer and the lives he becomes entangled with after what he thinks is a slight moral slip is the stuff of good intentions, but it's ultimately slick pabulum. The film flows nicely as entertainment, but it offers little by way of surprises and even less in terms of meaningful insight. It's pretty smoke that dissipates soon after it has hit the collective atmosphere. Rent It.